If your dentist has recommended straightening your teeth to avoid oral health issues, or if you simply want to straighten your teeth for a better smile, Invisalign might be the best solution for you. But how much does Invisalign cost and is it a wiser choice than getting braces? The cost of Invisalign will vary depending on the complexity of your tooth issues, the number of aligner trays it will take to achieve straight teeth and the coverage your dental insurance provides. For simpler cases, Invisalign may only cost a couple thousand dollars. But very complex cases can cost as much as $8,000 or more. When you visit your dentist or orthodontist about Invisalign as a straightening solution for your teeth, he or she should be able to give you an estimated cost for treatment and help you determine what your insurance will cover. Because Invisalign is categorized as an “orthodontic” treatment, about 25% of Invisalign patients receive insurance compensation of over $500 on average, but up to $3,500, according to the November 2010 Invisalign Patient Survey. Next, you may use this Invisalign calculator to help figure out out-of-pocket costs and payments. 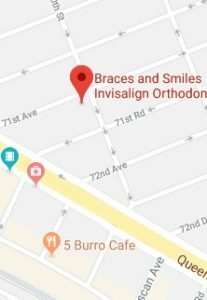 Of course, many orthodontists like Braces and Smiles - Queens NY Best Orthodontist for Invisalign & Braces, will offer additional payment plans or options to help make the treatment more affordable, too. Plus, since it’s an orthodontic treatment, Invisalign qualifies for Flexible Spending Account (FSA) reimbursement. If your company offers an FSA, you can plan ahead with your benefits department to save additional money on your Invisalign treatment since this is a pre-tax contribution. If you’ve talked to your dentist or orthodontist about Invisalign and braces to straighten your teeth, you may already know that the two treatments may cost about the same, depending on your needs. But Invisalign saves on other ‘costs’ that make them more practical than braces. Comfort: Invisalign aligner trays are made of smooth, comfortable, BPA-free clear plastic, and are worn over your teeth to subtly and gently move your teeth. It eliminates the problem of metal wires rubbing and even cutting into your mouth, which can be a major concern if you play contact sports. Time: You still have to wear Invisalign aligner trays for 22 to 24 hours a day for 6 to 18 months typically. But you only need to schedule appointments every 4 to 6 weeks, compared to every 4 weeks with braces. So Invisalign can save you time spent at your orthodontist. Confidence: If the idea of metal wires and brackets running through your mouth, or food hanging out in them after each meal, causes your confidence to waver, Invisalign can save you this added cost too. Because they’re invisible and you simply remove them to eat, you have no reason to feel self-conscious with Invisalign. Only your dentist or orthodontist can truly answer “how much does invisalign cost” because it requires a thorough exam of your mouth to do so. Keep in mind that not everyone makes a good candidate for Invisalign. If you have complex issues or need to move teeth vertically for example, braces may be the most effective treatment to straighten your teeth. Meanwhile, if you’re ready to start straightening your teeth with braces or Invisalign, contact Braces and Smiles - Queens NY Best Orthodontist for Invisalign & Braces today.